Enjoy the third annual St. Nicholas Festival, Saturday, Dec 1st, from 11-5 PM, where you can meet the real St. Nicholas, whose gift giving started a legend that spread around the world. This year you can PRE-ORDER International Food and pick up on festival day. Find answers to some FAQs below. 1. Why do you have an International Menu? 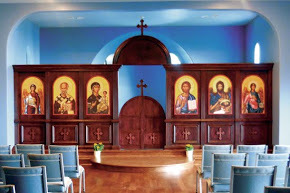 The Orthodox Church is a global church, organized into national jurisdictions, such as the Greek Orthodox Church or the Russian Orthodox Church. St. Nicholas is part of the ancient church of Antioch, where "they were first called Christians." 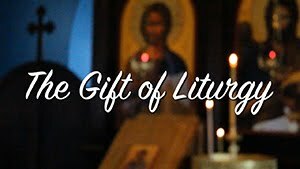 (Acts 11:26) Because the U.S. is still a relatively young country, we do not yet have an American jurisdiction; and so you'll find Greek, Russian, Antiochian and other Orthodox churches begun by immigrants and missionaries. 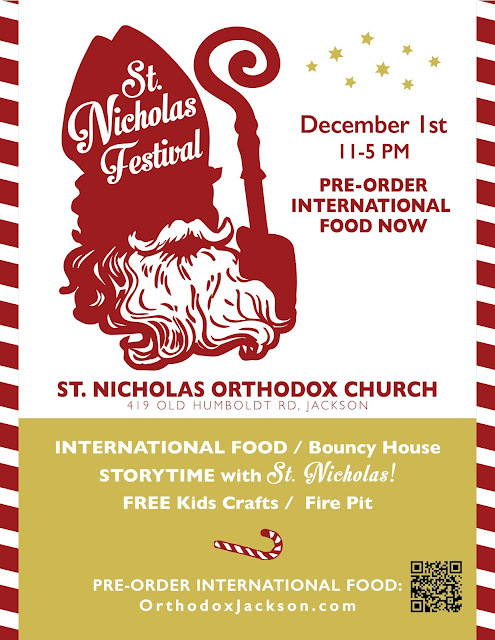 St. Nicholas is the only Orthodox Church between Memphis and Nashville, so our parish is made of Orthodox families of many nationalities and heritages. This is a common in the U.S. as we work toward building an American Orthodox Church. In the meantime, it creates a diverse community built around a common, ancient Christian faith. And it means a lot of great food! Our International Menu reflects various heritages present in our parish. Admission is FREE, however, there is a suggested donation of 1 CANNED GOOD per person. The food drive will support our Little Free Pantry. Admission gives you access to story time with St. Nicholas, church tours, the fire pit, bouncy house, and free kids' crafts and activities. Inside you can shop in the St. Nicholas Marketplace or order from our International Menu. 3. What is the Little Free Pantry? 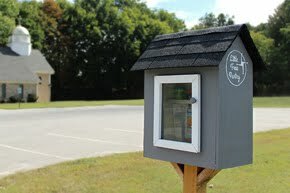 The Little Free Pantry (LFP) is a little pantry located in our parking lot across from the mailbox. The LFP is intended to address food insecurity and develop community among our neighbors. We stock it with non-perishable food and toiletry items for anyone with a need, as well as after school snacks and fun treats for our neighborhood kids. While the parish at St. Nicholas maintains the LFP, anyone is welcome to stock or take items from the pantry; take what you need; give what you can. In the spirit of both St. Brigid's hospitality and St. Nicholas’ secret generosity, we invite you to participate with us in this effort. 4. My kids love Santa Claus. Will learning about St. Nicholas confuse them? Traditionally, the Church celebrates St. Nicholas on December 6 and the birth of Christ on Christmas. In our parish, some families open treats from St. Nicholas on Dec. 6 and others on Christmas; some call him Santa Claus and some distinguish them as different people. At our festival, we respect all the varied ways that people celebrate, and we don't want to ruin anyone's fun. Our St. Nicholas is a friendly, gift-giving storyteller, who will emphasize his kindness and generosity. He'll tell stories about the historical St. Nicholas, including the origin of Christmas stockings, as well boats, famines, and miracles! He probably won't mention the North Pole or reindeer, but you can trust him to be discreet when speaking to children.